We had a tsunami warning here in Southern Cal yesterday due to that awful 8.8 magnitude earthquake in Chile. Of course like morons who run towards a fire to watch its destructive powers, the hordes were amassed at the beaches to watch the tsunami. They were disappointed. The tide was less than three feet high. Most people didn't even know it had come and gone. 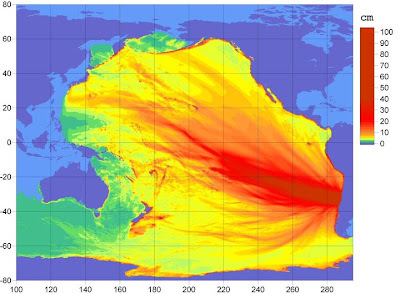 The above picture is a cool graphic of the height of the expected tsunami across the Pacific Ocean.